~11 million lines of Java in Marshmellow release 1 (tag 6.0.1_r1)! 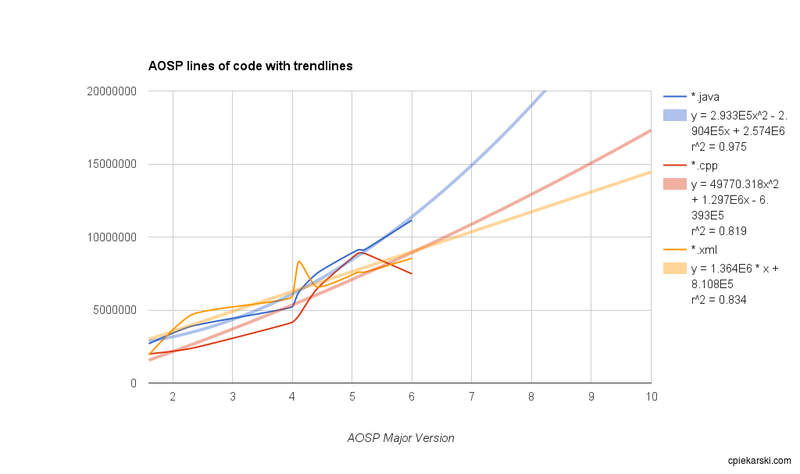 The XML trend line is linear and both Java and CPP are polynomial to the 2nd order. Is it possible there will be ~20 million lines of Java by release ‘O’? This entry was posted in Code and tagged Android, AOSP on February 5, 2016 by cpiekarski. This entry was posted in Code and tagged Android, AOSP on March 4, 2014 by cpiekarski.